The cooling capacity of an air conditioner unit for instance how much heat it can remove from a home in an hour is measured in tons. Selecting a unit the right size is vital. Choosing a unit too large will result in the unit switching on and off regularly while choosing a unit too small will result in the unit running too frequently and not being able to sufficiently cool your home. The air conditioners’ capacity should be considered based on the room’s floor size. An approximate measure states that 1 ton is ideal for an area in range of 120 to 140 Sq. ft., 1.5 ton is appropriate for a 150 to 180 Sq. ft. area and 2 ton capacity air conditioner is perfect for 180 to 240 Sq. ft. area. 2.5 ton ac unit, therefore is ideal for rooms that are very spacious and the floor size of the room should be more than 240 Sq. ft. When people talk about size in reference to air conditions, it does not refer to the measurements of the appliance itself, however instead it means the cooling capacity, as calculated in BTUs. Whether you are selecting a central air unit or window air conditioner, you will get the best efficiency, and thus lower operating costs, if you select based on the size of the area the unit must cool. To choose the right size of air conditioner, you will need to first estimate dimension of the home spaces in square feet catered by the air conditioner. To calculate the size, simply multiply the breadth and the length of the room or area to be chilled. After this, multiply the total sq. ft. times with 25 BTU. This enables sufficient cooling. An air conditioner that is too large can be overloading. To dispute the rumor that larger is better, an air conditioner too big will cool faster, but that may obstruct the reason for running the air conditioner in the first place. On the other hand a smaller capacity air conditioner for a larger space will increase your electric bill and it is not likely that the unit will be able to cool the area effectively. 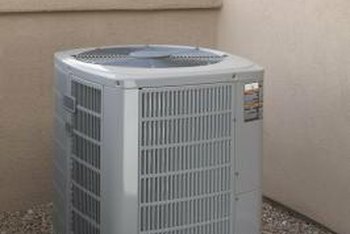 The best thing that you can do is get in touch with the local appliance store or the heating and cooling center as they can help you in choosing the proper air conditioner size for your home. Keep in mind that too little is never sufficient and too much of a good thing can be terrible. The qualified HVAC contractor can carry out a cooling load calculation using software that crunches data about the unique thermal characteristics of your home, and generates the specific BTUs of heat that need to be eliminated from the house every hour to maintain a cool temperature. With this simple information, the right A/C with the apt tonnage rating can be selected which can cool the home sufficiently and give the users a comfortable feel.